I was several miles into the bike leg of a recent triathlon when I reached to my back pocket for a wildberry bar (a better tasting fig newton) and realized I had accidentally dropped my Ziploc bag of bars in the transition area. While slightly annoyed at my “too cool for the lame-o energy caddy on my awesome Cervelo–that’s what back pockets are for” attitude, I realized I would soon begin to feel an energy lull if I didn’t take in some food, fast. Plus, the super-fit 80-year-old with calves of steel was keeping pace a few bike lengths behind me, and my pride was at stake. 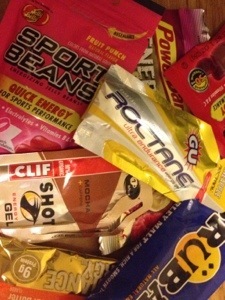 I yelled for a few energy bars at an upcoming aid station, and received some gummy, liquid-filled Poweraid something or others. I had never even seen these squishy blocks before, but I chewed them down and kept hammering. Very soon, I remembered the old rule, “Don’t try anything new on race day.” My stomach rearranged itself, and I faded quickly behind Grandma Iron-Legs (who, I might add, was contently gloating). By the end of the ride, I was downright green and not looking forward that the upcoming run. For any race you’re entering, don’t leave your nutrition up to chance. Find out what will be offered at each aid station by looking at the race sponsors–which will usually indicate what they will serve when you ride or run desperately up to them–or get in touch with one of the event coordinators to ask them for sure what you can expect. In the weeks leading up to your event, test out each food and drink to see how it reacts with your digestive system, or to find out whether you can actually choke the food down. Of course, don’t totally abandon your usual food and drink combo (unless maybe the new foods work better!). But just trying the event’s nutrition will help you decide whether or not you’ll have to grin and bear that Lezyne Energy Caddy sitting on your frame, or you can just rest easily knowing an unexpected need for food will work out with you finishing strong.